It was 1876 when a very rudimentary map was created for St. Armand, Wilmington, North Elba, and Keene. 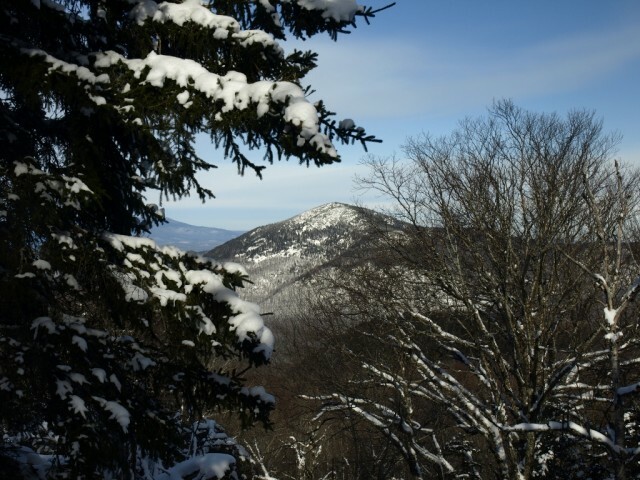 Essentially it was a wide overview of Essex County and showed basic locations of mountains and other features, but one feature caught my eye: Leggett Mountain. 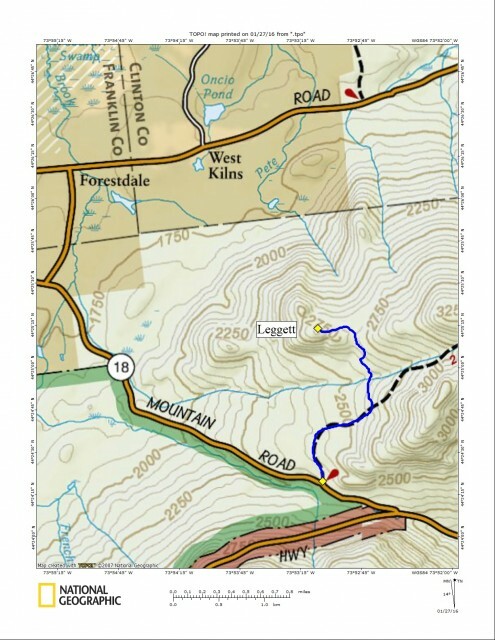 What is Leggett Mountain? I had never heard of it, and it surely doesn’t exist on any maps I had ever seen before. Researching other old maps — USGS maps, online maps and more — I just couldn’t see it named anywhere else. Now that Leggett was stuck in my head, I had to find its location on a map with actual contour lines and geographical features, and then go there. The best I could come up with was a small 2,858-foot peak just slightly north of east from Morgan Mountain. Cooper Kill or Cooper Kiln? After a long discussion with other historical fanatics we believe that Kiln makes more sense with East Kiln, Middle Kiln, and West Kiln in the region. Also, a “kill” is Dutch for creek and it was used where the Dutch first settled. For example, “kill” is used a lot in the Hudson Valley and the Catskill Region; in the Adirondacks it just doesn’t make sense. Our best educated guess is it was a typo on the part of the USGS. Much of the route to Leggett is designated for snowmobiles and it seems to be a popular one. The sleds have been using this trail quite regularly over the course of the days prior, and by the looks of things they used it that morning. With the slight smell of burning dinosaur bones in the air we moved along very quickly. Even though we actually tried to take it slow, we too had time to burn. 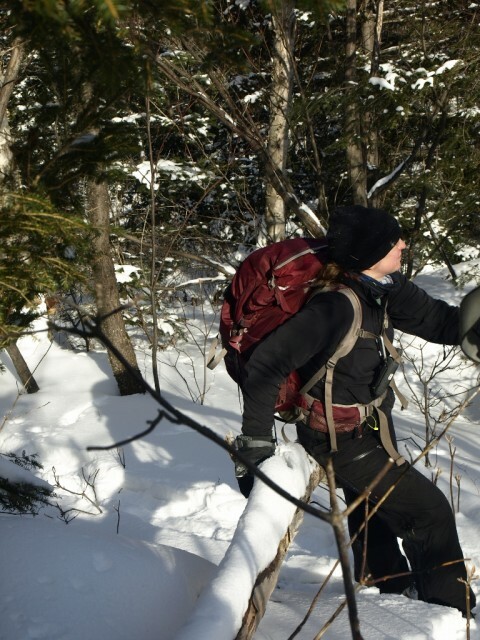 The trail was so hard packed that snowshoes were just a feature to help us with traction. We quickly came to the major intersection where the foot trail broke away from the snowmobile route and headed toward Cooper Kiln Pond. We needed to stay on the snowmobile trail and head toward Forestdale Road, where the sleds were also going. The trail descended a bit, and quickly we could see Leggett rising slightly in front of us. Taking a look at a small ridgeline, we could see where this trail would lead us. After we crossed the drainage in the saddle of the trail, we were on a new and well-built bridge as we started a slow climb up the shoulder. 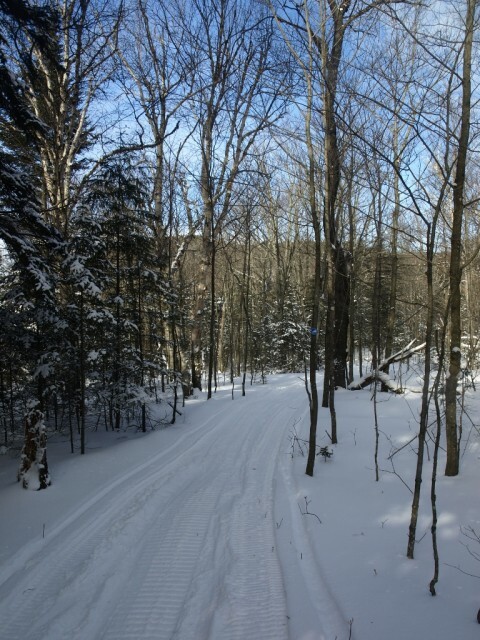 The terrain wasn’t all that steep, making for a nice snowshoe and a well-graded snowmobile route. 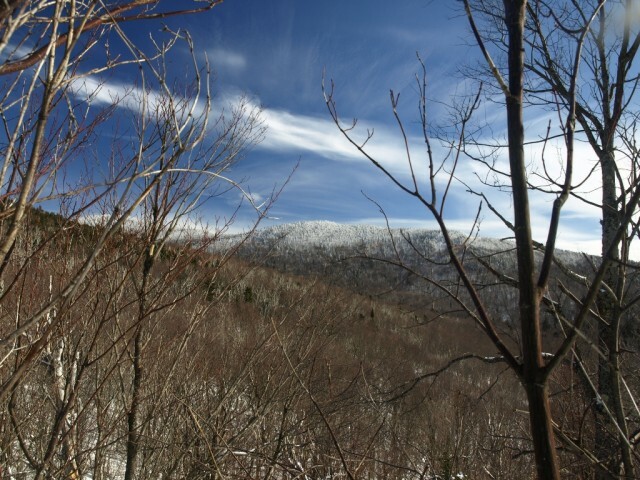 The trail switchbacked through the mixed forest of birch and balsam and delivered us just to the west of Leggett Mountain, 0.3 miles from the summit. The forest was an open white birch grove with small maples scattered in, hardly a beech whip to be seen. The ridge to the summit was a gentle walk with a solid crust and about 3 inches of wonderful powder. As the slopes started to get a bit steeper the evergreens remained dispersed enough to walk freely without any hindrance. 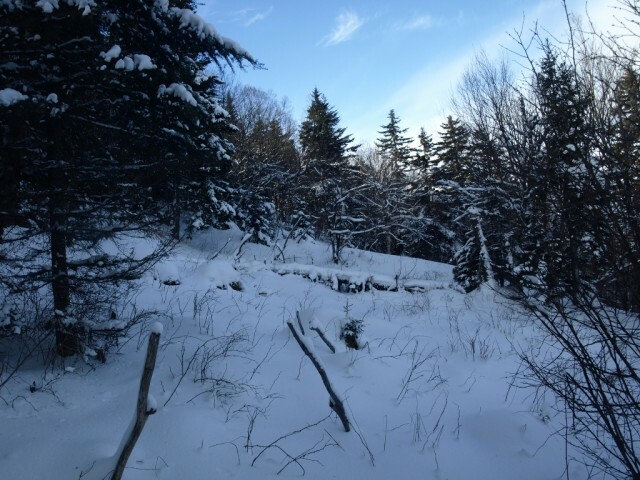 We worked our way around the north side of the mountain as we noticed a few clearings, and from there we had stellar views of Catamount, an angle from which I had never seen it before. From here it was just about 20 feet higher to the summit, where slightly obstructed views off toward Silver Lake awaited us. We decided to take a different approach for our descent and not follow our tracks back down, but rather stay high on the ridge and see if we could see any other viewing areas. I really wanted one of Esther and Whiteface. We didn’t find any views of Whiteface, but a screened-in view of Esther was there. A bit lower on the ridge a small open ledge gave us views of the Stephenson Range and Morgan Mountain. The sky was a deep blue and the clouds were dramatic as they moved in a local storm system, which we would soon be beneath. From here we skirted back along the base and to our tracks up along the ridge. The exit along the snowmobile trail was a rapid one and just a bit over 3 hours long. After we started we were taking off our snowshoes and making our way into town for lunch.